It's not easy for small-R republicans to appreciate how royalty augments the supposed legitimacy of the State, but it does. It's four centuries since Louis XIV remarked without fear of contradiction "L'etat, c'est moi" and since his time surviving monarchs have morphed into a much more subtle, but important role. Those not familiar with it could do worse than watch the 2006 Helen Mirren movie, The Queen. That focuses on the events in Britain following the death of Princess Diana, and nicely portrays the delicate relationship between monarch, ministers and people. The Queen has no power, but she has enormous clout; it's a paradox. The monarch is a figurehead and the embodiment of the State, though of course not at all in the sense that Louis used. States get by well enough without one, but they are enhanced by such personification; the monarch is "above" politics but at the same time endorses politics; he or she is "above" it in both senses. Brits get weary of particular governments every few years - with excellent reason - and kick the rascals out, expecting against all precedent that the next lot will prove less rascally, but unless royalty becomes soiled by scandal and idiocy, as theirs has for the last quarter century, they never get weary of the presiding presence of the monarch, for that would be to become weary with the identity of the country itself, and then what would be left? And that's exactly the importance of royalty; without ever stooping or needing to say so, the monarch tells everyone that "country", or State, is a valid, vital concept. More than anyone else, (s)he embodies it. In London today, the bunch of brigands ruling and ripping off 55 million people is called Her Majesty's Government, as if Elizabeth had some right to rule and had delegated this task or that to her various Ministers. It's all fiction and pomp, but it's mighty impressive. There must be something special, must there not, about all those palaces and jewels and Rolls Royces and all those investitures and titles. Take all that away, and what indeed would be left? That residue would be a piece of cloth. That is what republicans are obliged to revere and hold sacred, that to which they swear allegiance. How ridiculous can one get? - yet it is that to which we are reduced. Clearly one cannot genuflect to a politician or his party, for that would too obviously reveal that it's not the voters who rule but those we vote for; so instead a symbol is invented - a flag - to which all parties and politicians bow. Observe the religious nature of government; it's as clear an example of idolatry as one can expect to see outside more primitive cultures. And being made usually of stone, theirs are more durable than fabric. So it's important for statists, in the Old Country, for Kate Middleton to marry her Prince at the month-end with a billion watching, and in due course to become Queen Catherine. 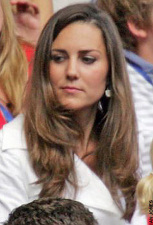 It ought to be (but is not) a great sadness to her parents, who have built a respectable fortune from a business that pleases customers who choose to buy, but Kate will spend her life endorsing and helping sustain a large kleptocracy whose business is to deny choice - and will, alas, be widely admired in the process. All being well, she will help restore the image that has become so damaged by her husband's father, uncles and aunts by showing she is both normal and, yet, mysteriously regal. It's all a key part of the vast deception called government. After it has evaporated, there as here, there will remain some who inherited wealth and prestige. But none of them will embody or represent the state, for there will be no state for them to represent. Each resident will be the absolute monarch of his or her own life; and of nobody else's.